I found fabric for the Little French Jacket Sew Along. 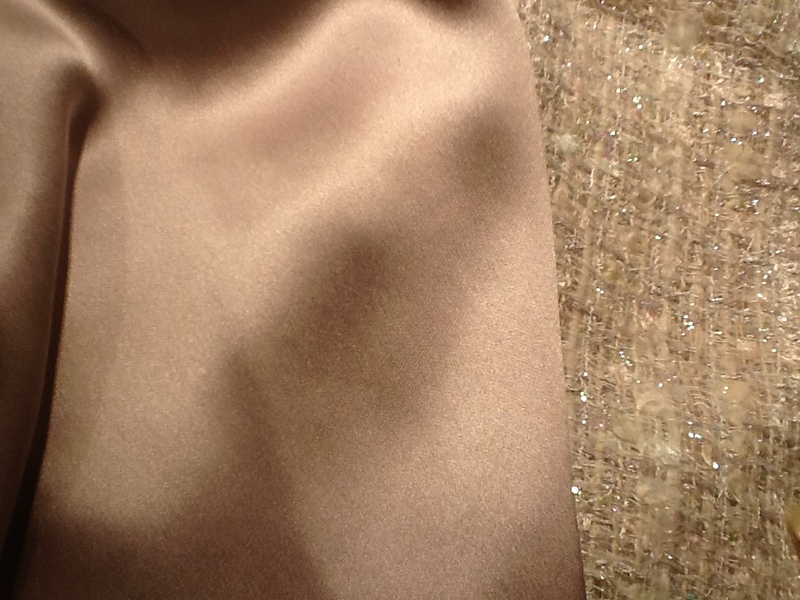 This is a metallic tweed and I found a lovely light lilac charmeuse for the lining. Also found buttons but I’m still searching for trim. Fortunately the trim goes on last, so I have time. 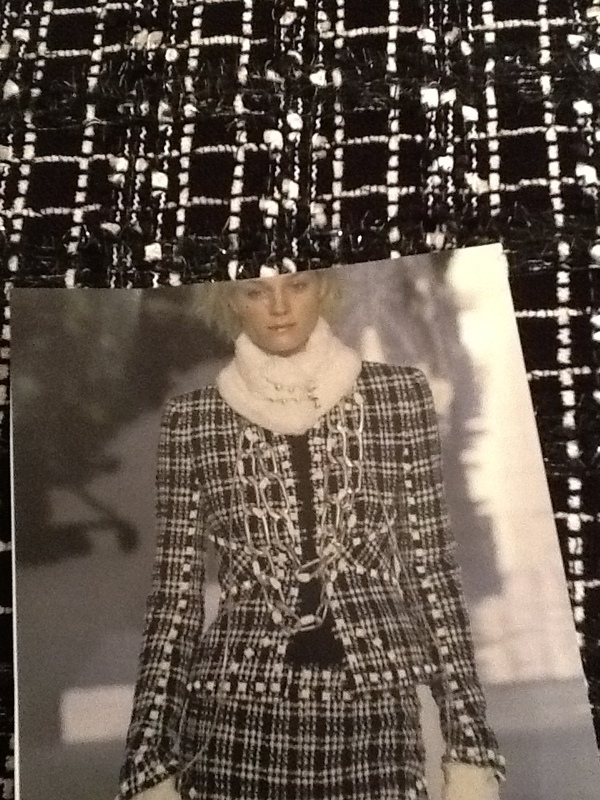 I found this photo and fabric and want to finish this before starting the quilted jacket. Here is the photo and I found an almost prefect match at B & J Fabrics. I used a basic princess line jacket and added the shaped insert at the waist. The challenge was matching this plaid pattern. 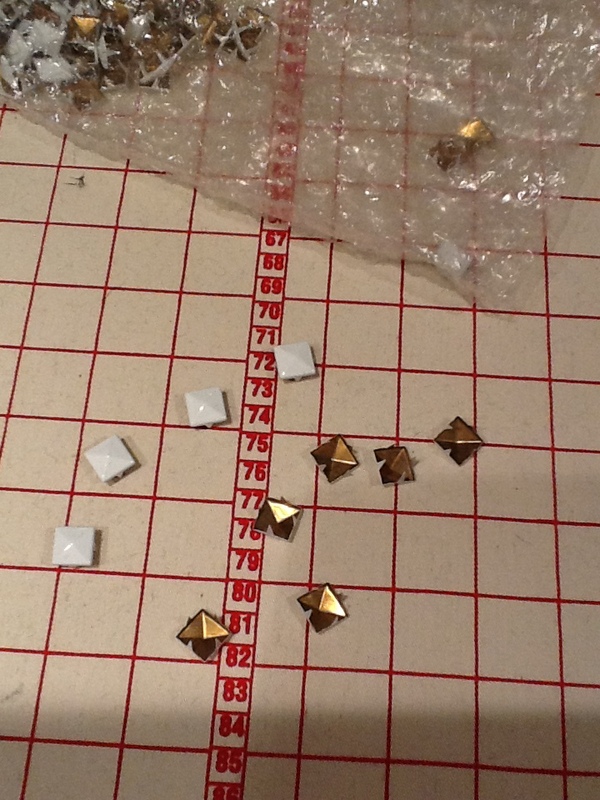 I cut a full pattern, both right and left sides, so everything could be laid out before cutting. The pattern has no seam allowances. Thread trace around each piece. Without seam allowances, it’s much easier to see exactly where the match points are. 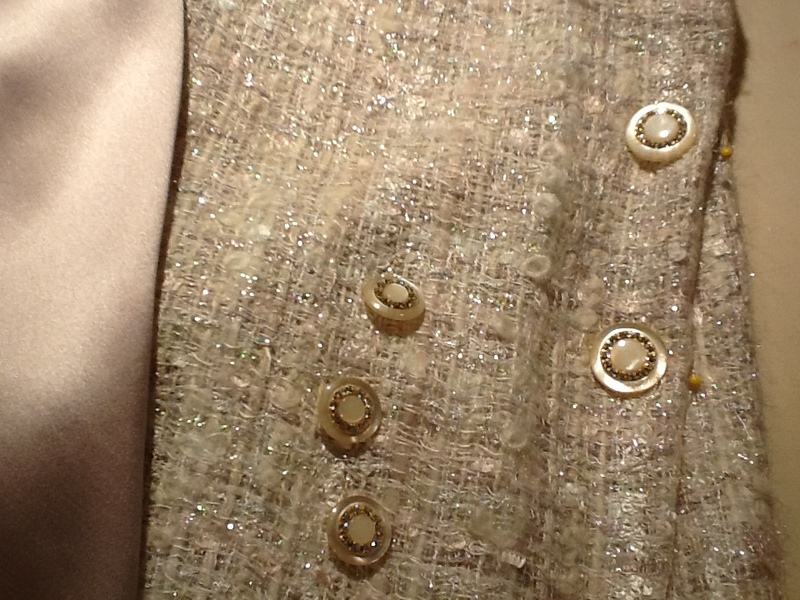 I decided to underline this jacket with silk organza. I usually throw the organza in the washer, dryer and then press. That makes the organza softer and preshrinks it. 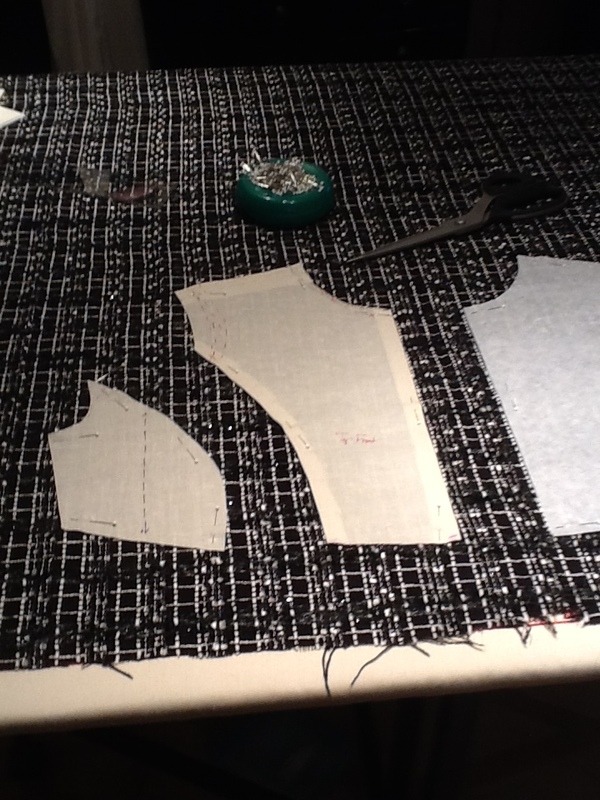 Baste the organza to each pattern piece, making sure to match the grain lines. 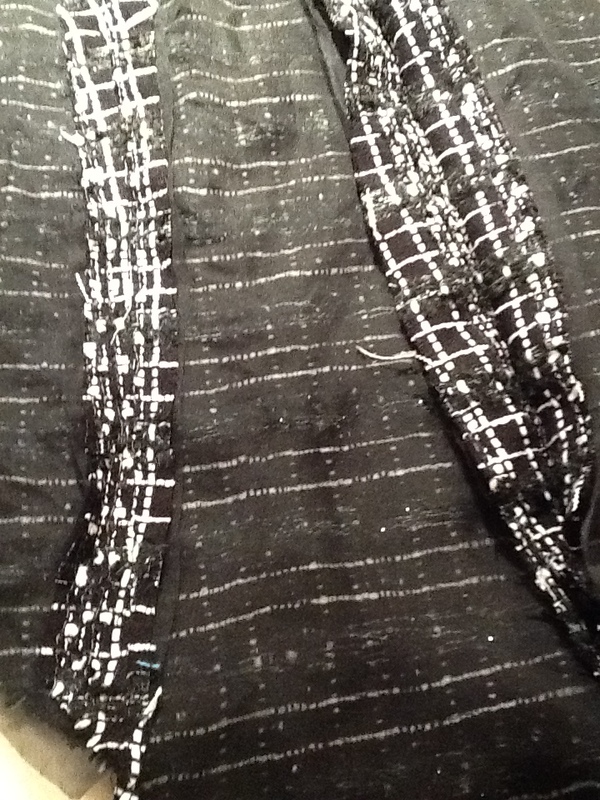 There is inly one way to match this pattern and that’s to thread baste each seam from the right side. 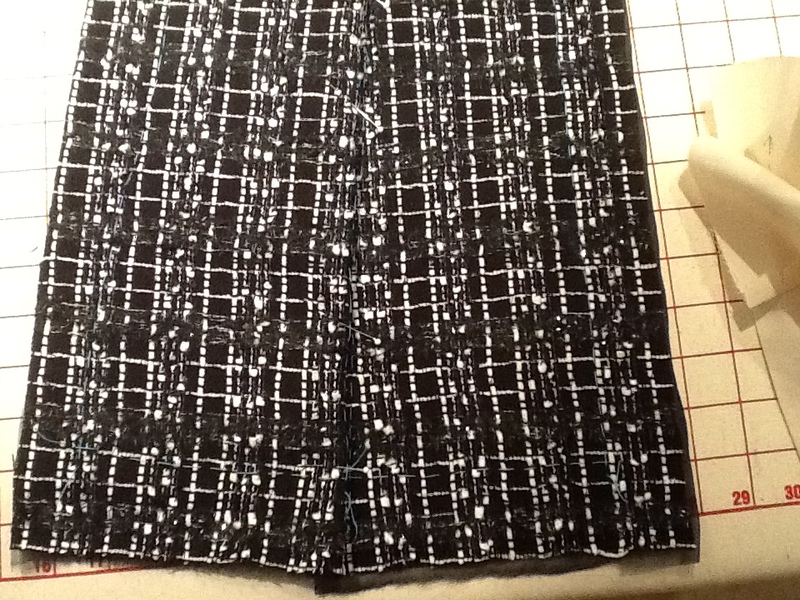 Turn one seam allowance under, match the plaid and slip stitch. This will hold your fabric without slipping when it is machine stitched. 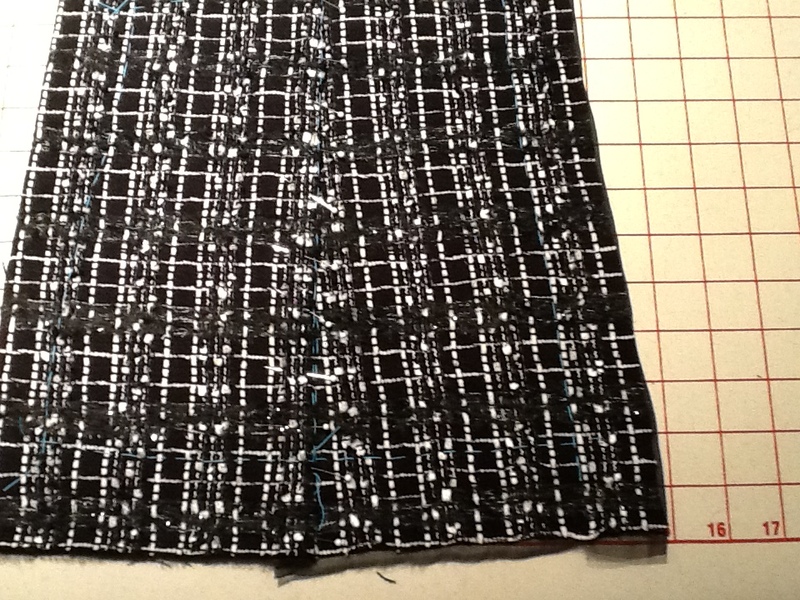 I slip baste with matching thread (in this case black), so it doesn’t need to be removed. You will need to remove the seam line tracing thread. End all machine stitching where two seam lines cross and tie a knot. Don’t cross one seam with another. It’s amazing how much more fluid the garment feels if you take this extra step. I can elaborate if this isn’t clear. Finally got the jacket body together! All that basting and matching does take time. I found the prefect white enameled studs on EBay. They are about 12mm in size and looked best to me placed with about 2 cm between each one. Some photos of the jacket so far. One more sleeve to go. Don’t cut the sleeves until your jacket body is finished. 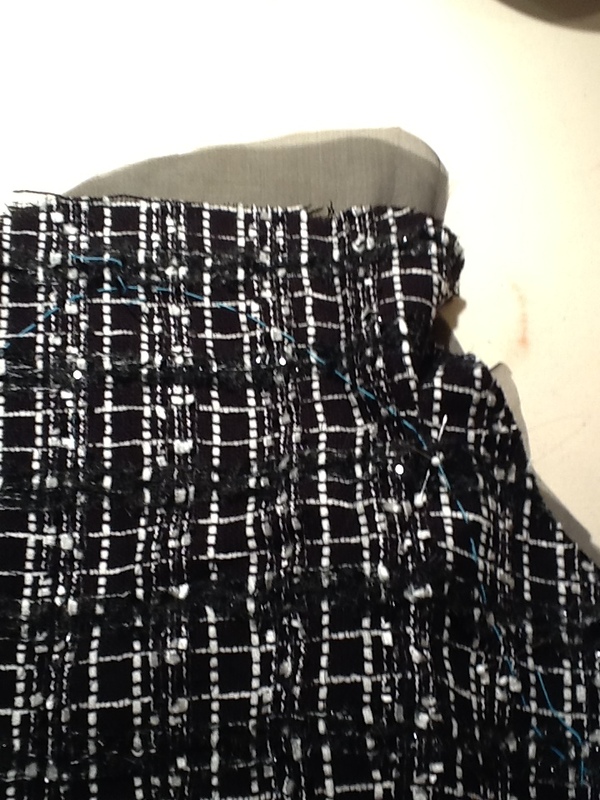 I make a muslin sleeve, pin it into the garment, and mark where the plaid pattern needs to be placed. 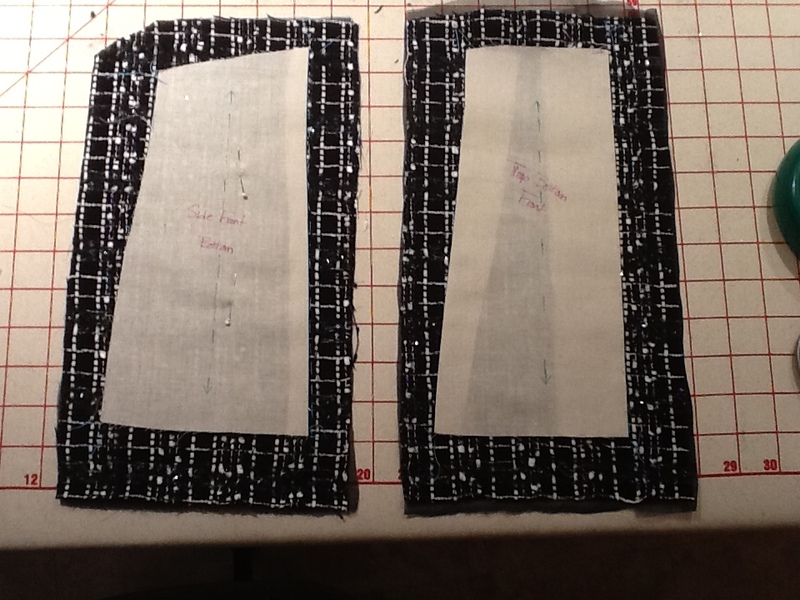 I then take the muslin sleeve and lay it on the fabric. Allow generous seam allowances in case you need to move up or down to perfectly match the fabric. Thank you for following my blog. I realize some of this is very technical but please post comments and I’ll try and clarify anything you aren’t sure of. I love couture sewing and appreciate the time and skill that goes into those spectacular runway designs. 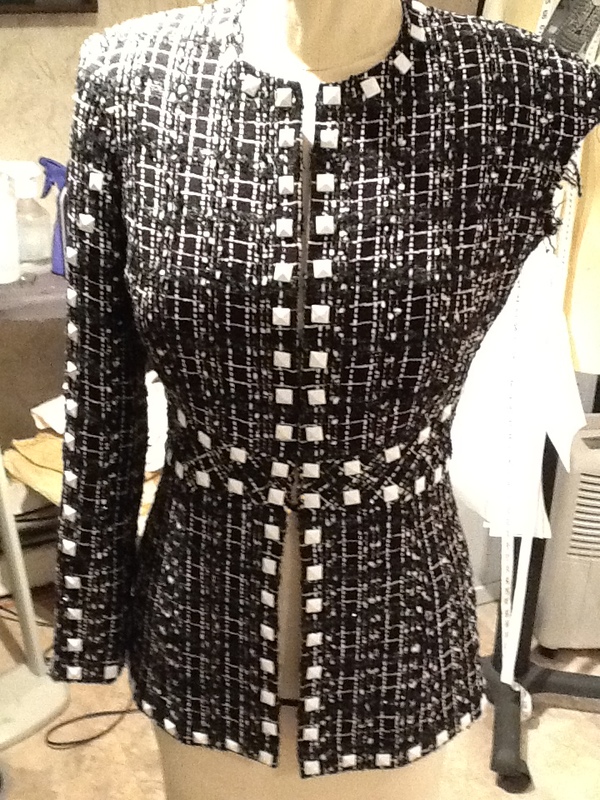 I’ll get this jacket (and hopefully skirt) finished and start on the quilted jacket next week. Please check back for updates. Wow! What a great creation! I love your jacket! Thanks for your comment. I’m following your blog and look forward to seeing your jacket. Thanks for following. I hope you enjoy watching my projects progress. Please comment/ask questions if you wish. Yes the black and white fabric is underlined with silk organza. 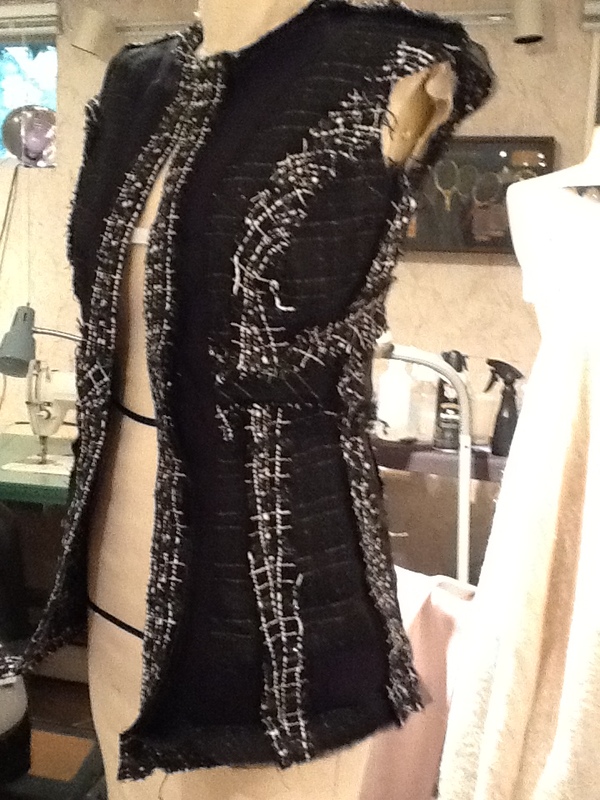 I don’t use underlining on the quilted jackets but this jacket needed a little more structure. Very clever. I really like your blog. Looking forward to more of your ideas. Thanks. I always welcome comments. Let me know if you have any questions about a particular technique or resource. I really enjoy your blog and your jacket is beautiful. Can you tell me where you got your studs? I found the studs on EBay. I remember the seller was located in China and had multiple sizes. Let me know if you have trouble finding. Thanks for the compliment and I hope you enjoy following my projects.